C. F. Martin 00-18 Model Flat Top Acoustic Guitar (1960), made in Nazareth, PA, serial # 174521, natural lacquer finish, mahogany body and neck, spruce top, Brazilian rosewood fingerboard and bridge, molded blue plastic hard shell case. 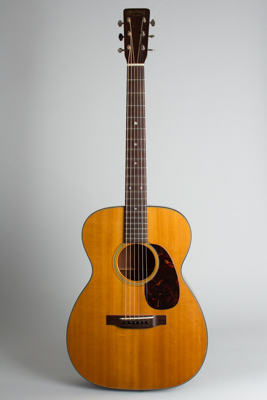 This very nice 1960 00-18 is a typical early "Folk Era" 00, built not long before Martin's move to a new larger factory in 1964 led to a host of production changes. It still has the classic older style features including the "long saddle" rosewood bridge, tortoise celluloid outer binding and pickguard, and Grover G-98 Sta-Tite tuners. It is built more lightly than later '60s examples and has a very lively sound. Of the 427 00-18s shipped in 1960, this has to be one of the better survivors! Overall length is 39 3/8 in. (100 cm. ), 14 3/8 in. (36.5 cm.) wide at lower bout, and 4 1/8 in. (10.5 cm.) in depth at side, taken at the end block. Scale length is 24 3/4 in. (629 mm.). Overall this is a very nice and all original example with a number of small dings and scrapes to the finish but no major play wear. The only crack damage is an impact spot to the side on the lower bass bout, sealed up but not overfinished and still plainly visible. The rest of the guitar shows no cracks at all. The neck has just been cleanly reset to the original full-height bridge, and playability is excellent. This guitar has a fairly bright tone with plenty of high-mid detail, and works equally well for fingerstyle or as a pure strummer. It resides in a slightly later Martin blue molded HSC. Excellent - Condition.